All over rural America, we see these metal exoskeleton buildings being built and comfortable interior spaces found within. Barndominiums offer all the amenities and comforts of traditional homes along with the assurances that these homes are also fireproof and more resistant to pests, such as termites. If you’re looking for an energy-efficient home building method, a barndominium may be ideal for you. Building a barndominium is as easy if not easier than building a regular home. Broadshield has years of experience and is one of the top builders of in the region. 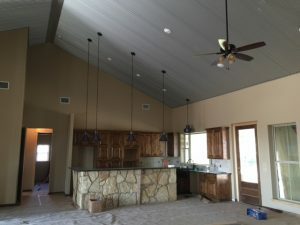 Having your own barndominium is less costly than building a traditional home because these metal homes are faster to construct and utilize less costly materials. Some people also call barndominiums “barn homes” or “barn living areas.” By nature, they offer more living space and maximize the living space that is there. One of the greatest benefits of barndominiums is the flexibility the homeowner has in the layout and design of the interior space. Generally speaking, these metal homes won’t limit where you can and cannot add or omit a wall, so the internal space of the structure can be as sectioned off or as open as you’d like. Check out our barndominiums gallery to see for yourself the kind of modern luxuries you can find within these metal homes. Want a speedy, efficient, and green building method. Want to spend less than would be necessary in purchasing a traditional home. Want to have the freedom to design the home interior with few or no restrictions. Want to reconnect with nature while still enjoying modern home comforts. Take your country home dream to the next level, and call the Broadshield team to begin your barndominium building process today. After meeting with our project managers and learning all the perks about “Barndos,” you and your family will be convinced that a barndominium is the way to go! Get in touch with us today. You can call or contact us online by clicking the button below.